I’m not a “car guy”-I don’t know a radiator from a carburetor, I’ve never been tempted to trade in my dusty pick-up for a shiny sports car, and I don’t really understand the constant left-turning that is NASCAR. But, like any red-blooded boy from the good ol’ U.S. of A., I grew up with posters of Ferraris and Lamborghinis on my walls, ma stered the arcade games Pole Position and Out Run, and relished that I was a passenger in a Saleen Mustang going 135 miles per hour as “my fastest ride.” Which is to say that while hot-rodding never shaped my existence, I can’t deny the need for speed is imprinted on my soul, a nasty itch that occasionally requires some potentially dangerous scratching. 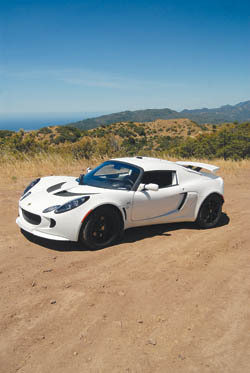 The supercharged Lotus Exige S.
Enter CoolCarsSB.com, a four-month-old company at 532 Garden Street that rents exotic and luxury cars, from the $99-per-day Mini Cooper to the $700-per-day Aston Martin Vantage. Co-owned by realtor Mark Heitmann, a native Santa Barbaran, and T.C. Kline, a legend in the racing world and a professional enhancer of BMWs, CoolCarsSB.com, is an offshoot of their AutoSport West car components business, which they opened a few years ago as a West Coast branch of Kline’s national business. The rental business is slowly growing-already quite popular as birthday and anniversary presents-and they anticipate it’ll take a year to catch on. To succeed, CoolCarsSB.com, must attract the tourists who come to town for a couple weeks, a market that’s traditionally locked up by the big rental companies. But unlike the big companies, Kline promised they’ll take a car anywhere to be picked up, whether that means the airport or your driveway. But it’s also the most impractical vehicle I’ve ever seen-there’s no back seat, the front seats are squeezed together and difficult to get into, there’s no glove box or place to store anything, the rearview mirror looks squarely at the rear-mounted engine casing, the clearance is so low that you need to take street corners wide, and the trunk is the size of a large backpack. Its current rate is $325 per day, so for $650, you can rent the $65,000 car for literally 1 percent of the purchase price. Translation: Get the need for speed out of your system before you spend your annual salary on a car you’ll only drive three times per year. And so I climbed into the Lotus last week, much like a fighter pilot crawling into his cockpit. The engine roared to life with the push of a button, and Heitmann ushered me off the lot and into my sports car dreams. Unlike other fast cars I’d driven, the Lotus was surprisingly easy to handle-I’d half-expected to peel out due to the supercharged power, but I managed to slip out of the parking lot with ease, no chirping or even over-revving at all. From there, I was off, getting countless stares from Santa Barbarans before tearing up the 101 to Highway 154, firing into the Santa Ynez Valley, hitting the corners and roller coaster-like undulations of Armour Ranch Road. I stopped by Old Town Santa Ynez for more looks of envy and quirky comments about the impossible-to-ignore vehicle. Back over the mountain, I stopped a couple times to let traffic pass, so I could let loose on the Lotus while driving uphill and testing its limits. 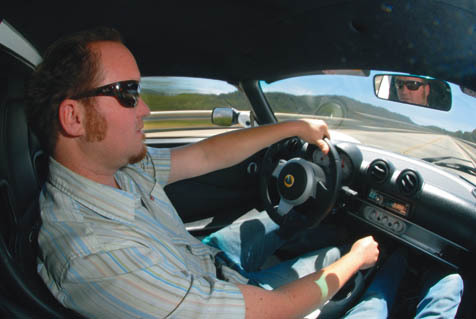 I didn’t get anywhere close: No matter how many RPMs-and the gauge went up to 10,000-the Lotus wanted more, and the time I went to sixth gear was entirely unnecessary. But since fast cars are designed to handle perfectly at high speeds, going fast doesn’t seem that remarkable in the Lotus, save for the g-force on your face. 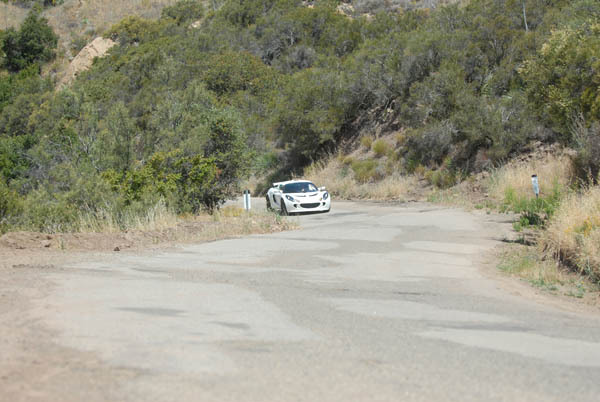 More exciting was the tight turning capabilities of the Lotus, so I hit East Camino Cielo, and drove the high mountain boulevard all the way to Gibraltar Road. 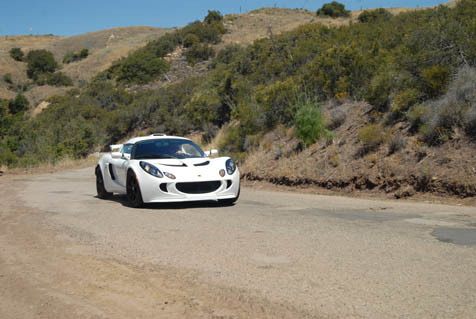 A little too bumpy to recommend-the Lotus sits on tight suspension very low to the ground, so beware of potholes-East Camino Cielo was nonetheless the morning’s highlight, an empty road of twists, turns, ups, downs, and views from Figueroa Mountain to the Channel Islands. Once back in town, I had time for one last freeway jaunt, the chance to top the elusive three-digit speed. I made it, still not in sixth gear, which probably means the Lotus’s 160-mile-per-hour speedometer is not an exaggeration. 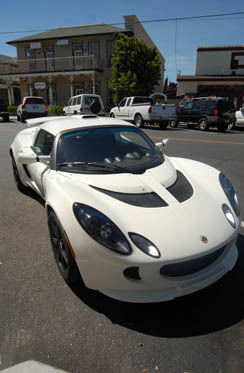 As I filled up the tank on Milpas Street-I’d burned five gallons in about three hours-another driver asked, “Where’s the go-cart track?” I just let out a little chuckle, not wanting to tell him that with the Lotus, the go-cart track was everywhere. To satisfy your need for speed, visit CoolCarsSB.com call 892-2001, or head down to AutoSport West at 523 Garden Street.